Hey there! Despite my last post, I can't contain my excitement for Valentine's Day this year. Out of the five years I've been with Alan, this is the first Valentine's we'll get to spend with each other(on the actual day). Usually we've been a part or he's had to work some crazy long hours; it almost didn't happen this year either, but luckily he will be back home the day before Valentine's --yay! I've really missed him these past couple of weeks, and I'm yearning for some quality time with my bestfriend --if ya' know what I mean. To keep my mind off of missing Alan, I've had to keep my schedule filled with activities; one being challenging my inner baker. I'm going to let you guys in on a little secret-- I am a terrible baker, like, I am a serial killer of cakes. 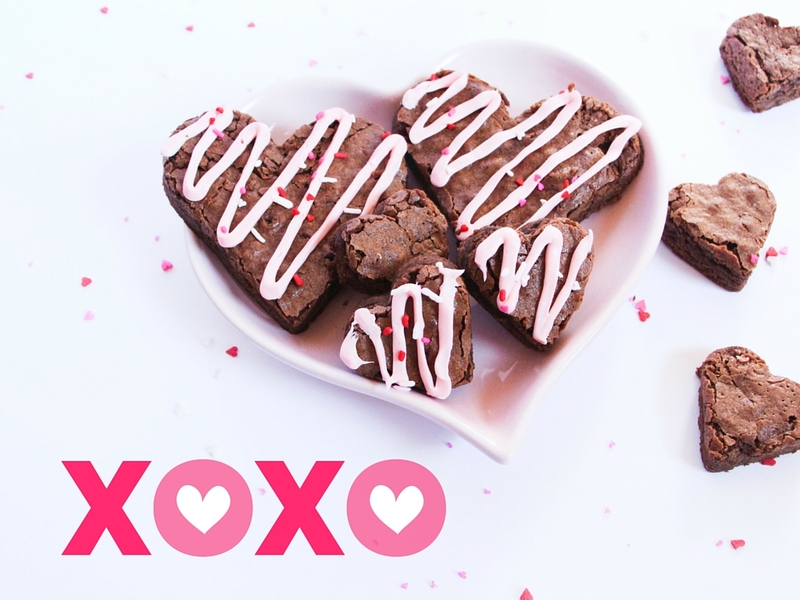 I'm slowly getting better; which is why I am thrilled to share these DIY Valentine's Day treats with you, because if I can make them, so can you! Directions: Grease 9x13 baking dish, bake as directed on the box. Let the brownies cool, I repeat, LET THEM COOL (this might take a few hours). I covered mine with saran wrap then poked holes in the wrap with a fork and stuck them outside for about an hour and they still weren't cool enough. 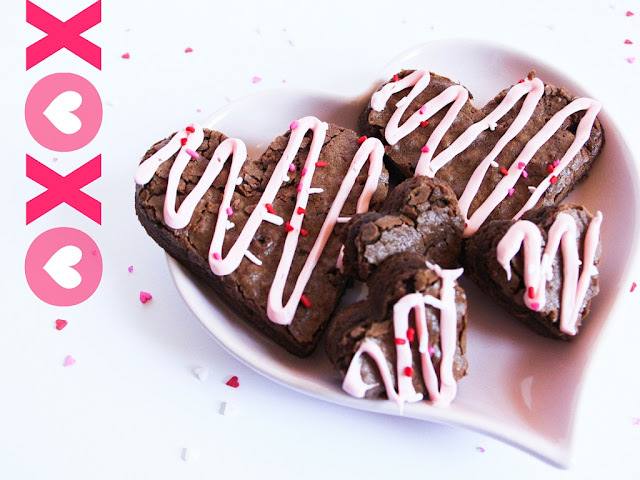 Using the heart shaped cookie cutters, began cutting your shapes out in the pan and then carefully place them on parchment paper. Cut the heart shapes close together, ensuring you get the most out of your brownies as possible. Next mix a 1-3 drops of red food coloring into half a jar of frosting and mix until pink (or desired color), place the colored frosting into a ziploc bag and squeeze towards a bottom corner of the bag, twist the top of the bag imitating an icing bag then cut the very tip off creating a small hole. Lastly, ice the brownies, add the sprinkles, and then place in fridge for 10 minutes to help solidify the frosting.